Computer simulations of the plumes of liquid water that stream out of Jupiter's moon Europa show that the forthcoming space mission JUICE may offer an answer to the question as to whether the Jovian moon's subsurface ocean could harbour life. Hans Huybrighs comes to this conclusion in the doctoral thesis he has recently completed at the Max-Planck Institute of Solar System Physics and the Technical University Braunschweig, Germany, in collaboration with the Swedish Institute of Space Physics in Kiruna. A deep ocean of liquid water is hidden under the icy surface of Jupiter's moon Europa. Life might have developed here, shielded from sunlight and curious observers from planet Earth. Peeping through the ice to find traces of this hypothetical life is easier said than done, especially when you realize that the ice could be several kilometres thick. In 2022 the European Space Agency (ESA) will launch its space mission JUpiter ICy moon Explorer (JUICE). The JUICE spacecraft will arrive at Jupiter and its icy moons in 2030 and on board will be the Particle Environment Package (PEP) developed at the Swedish Institute of Space Physics (IRF). 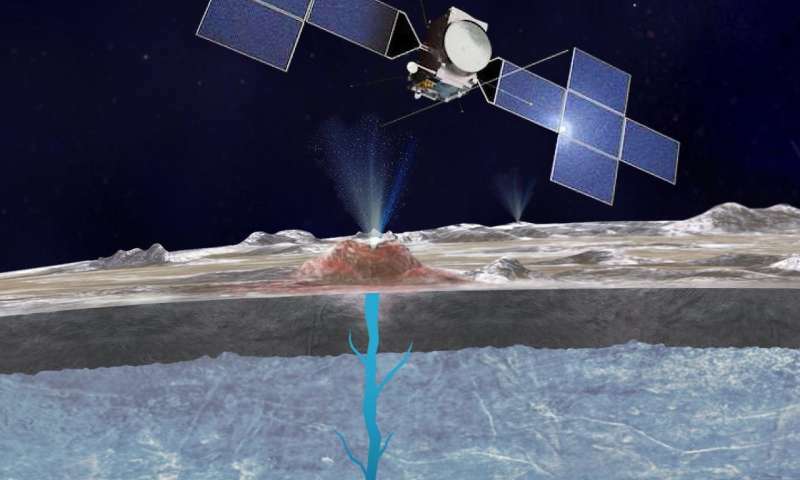 New research shows that PEP, an instrument consisting of several particle detectors, will be able to "taste" the plume in different ways and shed some light on the contents of Europa's ocean. Observations from the Hubble Space Telescope of Jupiter's moon Europa, made in recent years, have shown that water is erupting from Europa's surface. "Europa's plumes are the most straight-forward way to taste its subsurface ocean," says Hans Huybrighs. "Flying through one of the plumes of water and taking samples of the material could be the easiest way to study Europa's ocean. JUICE will be the first mission that might be able to do this." After its arrival at the Jupiter system in 2030, JUICE will make two flybys of Europa. To figure out if JUICE will indeed be able to sample the plumes, Hans Huybrighs and his colleagues made computer simulations of the plume eruptions. By calculating the trajectories of millions of particles launched by the eruption, it is possible to determine if the particles can reach the spacecraft and, if enough of them do, to detect them. The simulations show that though most of the particles fall back to the surface after the eruption, enough of them can reach the JUICE spacecraft as long as a plume is active near the spacecraft's orbital footprint. Interestingly, some of particles won't fall back. They become electrically charged after being bombarded by radiation particles moving in Jupiter's strong magnetic field. These newly-charged particles are no longer bound by gravity and will move away from Europa, guided by electromagnetic fields. Even though only a fraction of the plume particles become electrically charged, enough of these particles can still be detected by the PEP instrument. "Our simulations show that JUICE will be able to detect the plume eruptions in at least two different ways," says Hans Huybrighs. "It might even be possible to detect not only the water of the plume, but other substances that tell us more about the contents of the sub-surface ocean and its habitability as well." Hans Huybrighs defended his doctoral thesis, "A search for signatures of Europa's atmosphere and plumes in Galileo charged particle data", at the Technical University Braunschweig, Germany, on 5 December 2018.